My freshman year, I did an internship as a product designer with a scrapbooking company called American Crafts. It was such a good experience and I learned a lot of skills that have helped me to be able to design a lot of different things. But the most important lesson I learned had nothing to do with design. One time before a meeting, a co-worker named Shane told me who we would be meeting with and that I was going to love him. The whole time we were walking to the meeting room, Shane went on and on about how great this guy was and how talented he was. Because of what Shane had told me, I was paying attention and throughout the meeting, I found that this guy was just as awesome and talented as Shane had said. What I learned is this: You find what you're looking for. I also learned is this: I want to be in the habit of letting people know how awesome other people are. 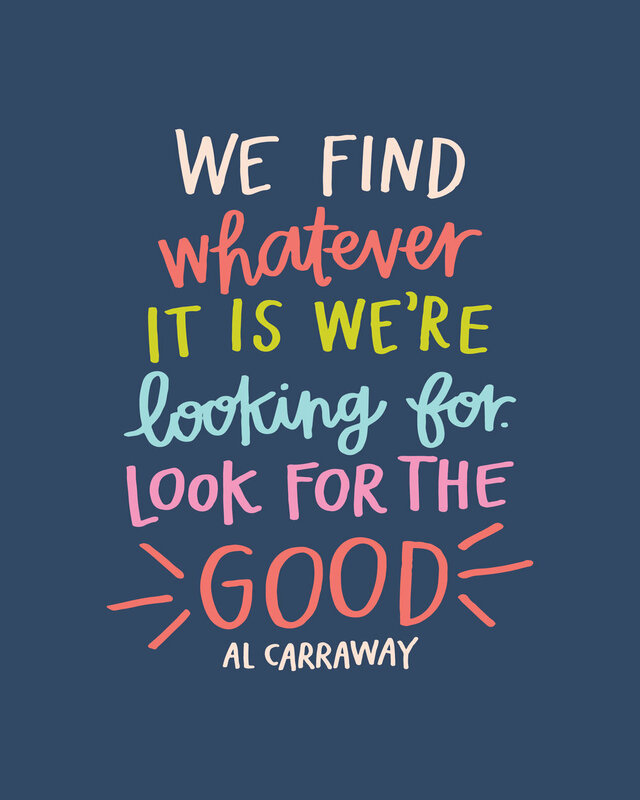 In order to do that, I need to be looking for the awesome in other people. In other words, I need to treat every person I meet as a child of God. One of my 2016 goals is to compliment more. I'm really good at seeing awesome things in other people, not so awesome at sharing that. I can't say it enough—YOU FIND WHAT YOU'RE LOOKING FOR. That includes what you find in yourself. Unfortunately I think we're much too good at looking for our flaws, and not nearly good enough at seeing just how awesome we are. So here's my challenge (and it's something I'm working on too! ): try to see yourself and others as God sees you. He sees you as you really are, His precious child. Try to find what it is that He knows to be awesome about you. Look for that awesome in other people and then tell them why they're awesome! If December taught me nothing else, it's that God will give you more than you can handle. The last couple of weeks of the semester were nearly the end of me. I had a lot of plans for this semester and speaking at one of my best friend's funeral certainly wasn't one of them. I've been behind this entire semester because of getting a concussion and other things, but this was the final straw, the point where I knew I couldn't handle any more. I was operating at more than 100% and for far too long. Quite simply, God had given me more than I could handle. The scriptures contain a lot of promises, but no where do they say that you won't be given more than you can bear. 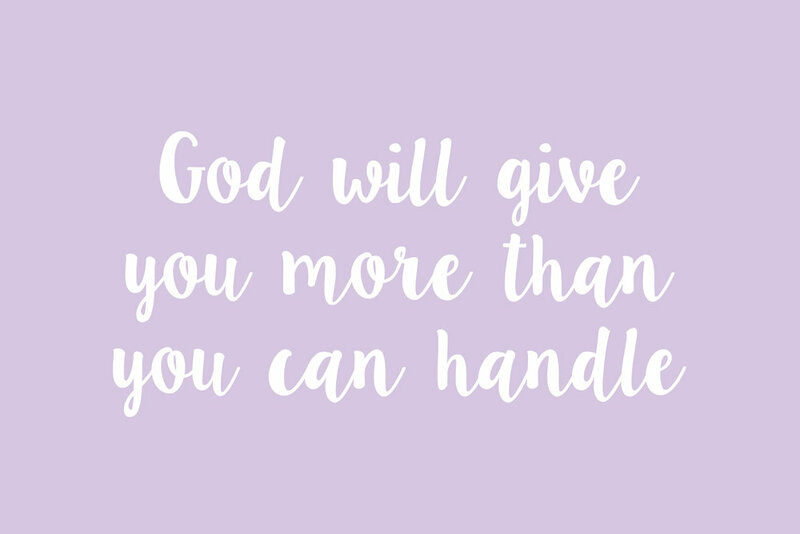 But the key is, God will never give you more than you can handle alone. God will give us more than we can handle because we are not meant to carry the load alone. Trials and burdens are meant to teach us to reach out to our Savior, to allow Him to help you carry the weight you were never meant to carry on your own. In Mosiah 24, the Lord did "strengthen up [Alma and his brethren] that they could bear up their burdens with ease. Sometimes God takes away our pain or trials, but I think more often he gives us the strength to get through them. We grow, not despite our trials, but because of them. The struggles of this semester caused me to rely even greater on my Savior. I cried and prayed every day to be able to do what I needed to. It's kind of like how you're always grateful for the ability to breathe, but you suddenly become a whole lot more grateful when you get a cold. I'm always grateful for a Savior to rely on, but trials make me rely on Him a whole lot more. 2015 was a year of an incredible amount of learning and growth, largely due to the trials that I experienced. I don't know what 2016 holds in store, but I sure am excited for the lessons and growth that are sure to come. Marissa (in the middle of the picture above) truly is an angel on earth and I am a better person because of knowing her. I was even lucky enough to be her roommate for 2 semesters. This spring, she was diagnosed with Lymphoma. From the beginning, I knew that she would handle it better than just about any other person out there. You see, this girl has an unshakeable faith and the best outlook on life. One of my very favorite things about Marissa has been illuminated even more these past few months: her ability to genuinely serve. While living with Marissa, there is one day I can remember that I can describe in no other way than pathetic. April and I shared a room and for some reason, we could not get out of bed for the life of us. I don't remember exactly what was wrong except that I passed out every time I stood up. April and I laid in bed alllll day being our pathetic serves. Marissa and McKinley, another roommate, came in, talked to us for a while, and were bewildered by our absolute pathetic-ness. Marissa disappeared and we figured she had gone to the kitchen or something because she couldn't handle the amount of pathetic in that room. A little while later, she showed up with vanilla ice cream for April and steak cut fries for me. An angel on earth, I tell you. It sounds small, but it was the absolute best thing that anyone could have done for us at that point. Marissa is just exceptionally thoughtful like that. She knew that vanilla is April's favorite flavor in the world and that the salt from the fries would help me stop passing out (because of my stupid low blood pressure). 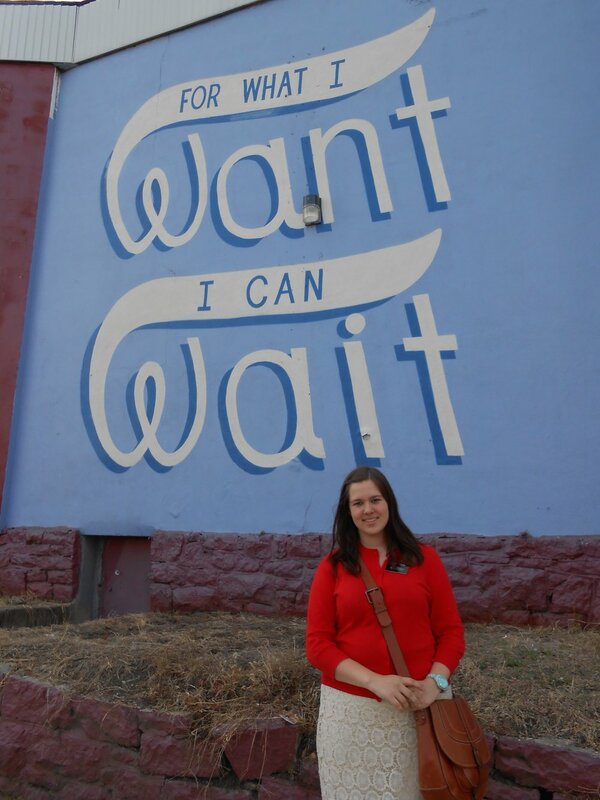 Since being diagnosed, Marissa has served everyone more than we could possibly serve her. She somehow manages to make the simplest things matter. Like a text message. A couple of days ago I told her that her text had made me laugh out loud while I was sitting in class. She responded that that was her goal. To make me laugh. And she does on a regular basis. Texts from Marissa are pretty much on the same level as Sunday naps. Marissa is the perfect example of doing what she can from where she is. Earlier this week she was hospitalized because she caught pneumonia. Her last round of chemo was supposed to start Thursday, but that didn't happen. Even while she was in the hospital, she was still trying to uplift other people. While I was in class Thursday morning, I found out that she had been transferred to the ICU and was getting worse. I had to fight back the tears while I was in class. Immediately I started praying and pretty much didn't stop all day. Praying that her parents would be okay. Praying that the doctors would figure out why she wasn't getting better. Praying that everything would work out with her last round of chemo. I had been up late the night before finishing a paper so between a lack of sleep and hearing this news, I really just wanted to go home and take a nap before my afternoon classes. I usually go to the temple on Thursdays, but I was exhausted physically and emotionally and really didn't want to walk all the way there. (Side note: I say "walk all the way there" because it really sounded like a trek in the moment, but really I am so incredibly blessed to live sooo close to a temple.) I remembered something that came up a lot last year. 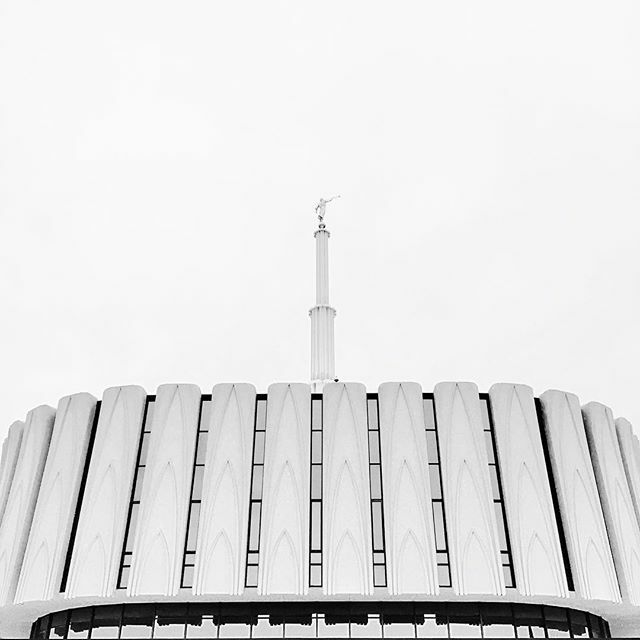 From several different speakers, I heard the same message, "make a time to go to the temple and then don't let anything get in the way." I realized that there probably wasn't anything better that I could do than go to the temple so I made my way to The House of the Lord. While in the temple, I found the peace that my troubled heart had been searching for. Even though I still waiting for answers concerning Marissa, I wasn't really worried. I handed that burden over to the Lord and replaced my fears with faith. While I was walking home, I found out Marissa had been sedated and intubated, but still I felt peace. I went to my other classes and then found out that Marissa was only partially sedated even though she still had the breathing tube. She was semi-awake and able to communicate with her parents. The medication she was on will cause amnesia so she won't even remember any of this ordeal. It was a small improvement and the doctors still didn't know exactly what was wrong, but my heart was filled with gratitude. While writing this post, I got another update. The original diagnosis of pneumonia was wrong and the doctors figured out the real problem. Her lungs will recover over the next few months and, the best news of all, she won't need that last round of chemo. Her body is cancer free! The hymn, "I Need Thee Every Hour" has always been one of my favorites. It's pretty easy for me to recognize my constant need to rely on my Savior, especially on days like yesterday. I can't imagine how hard it would be to go throughout life without a knowledge of the Gospel. I wouldn't make it through the day without knowing that I wasn't doing it alone. A couple of sisters in my mission changed the words to the hymn, which changed the entire meaning. Not only do we need Him every hour, but He needs us. Every. Hour. The words are meant to be read as if they are from Christ to us. Return to me; What joy! I've thought so much about this and decided that I want Him to be able to rely on me as much as I rely on Him. I was 18 and a half when the age change for missionaries was announced. That meant that within a couple of minutes, I had friends announcing on Facebook that they were going to submit their papers as soon as possible. Honestly I just remember being in shock. I was one of those lucky freshman who went to college knowing exactly what I wanted to do. I had a plan of what the next couple of years would look like for me, and serving a mission definitely wasn't a part of that short-term plan. The possibility of serving a mission had been in the back of my mind. I was planning on graduating from BYU right before I turned 21. Depending on what was going on in my life in that time, I considered a mission a possibility. I definitely hadn't made up my mind, but I hadn't ruled it out either. After the announcement, my initial reaction was excitement, especially for all my friends who had decided to serve. My next reaction was fear. I was not ready to jump on board with my friends who had already announced their plans to serve. I stayed scared. I wasn't old enough to go for 6 more months, so I decided not to worry about it too much, but it was such a prevalent topic, that it was hard to ignore. My gut feeling was that I did not want to serve a mission. I don't think I ever admitted this out loud because it seemed so selfish. The Gospel had brought me so much happiness. Why wouldn't I want to share that with others? I felt so guilty, but that desire just wasn't there. Over the next month or so, I felt little nudges and the topic of serving a mission always seemed to come up. I purposefully didn't pray to ask God if I should serve because I wasn't ready for an answer. Finally it got to the point where I couldn't ignore it any longer. I had felt so many promptings and at that point, I was pretty sure God wanted me to serve a mission. I was terrified to pray, since I pretty much knew what the answer would be. My dad scheduled a doctor's appointment for me, one of the first steps of the process of submitting mission papers. I guess at that point I had decided to start the process, hoping that as I did so, I would feel a desire to go. The first week of December, I finally humbled myself enough to pray. All my life I had been taught that the spirit speaks in a still, small voice. When I prayed to ask Heavenly Father if I should serve a mission, I couldn't even finish the question before I heard a booming "YES!" There were times in my life where I wasn't sure how to recognize answers to my prayers, but this time there was no denying it. I just started to cry because I knew without a doubt that Heavenly Father wanted me to go on a mission, but I was still so scared. I met with my bishop and then a couple of weeks after I said that prayer, my world was rocked. On my parent's anniversary, my mom was diagnosed with cancer. Surely the Lord wouldn't want me to leave given this news, so I decided to pray again. Once again, before I could finish the question, I heard the same "YES!" The spirit literally yelled at me. I know that's not how people commonly describe the spirit, but I think God knew I was going to need a very clear answer in order to have the faith to actually go on a mission. I continued the process of filling out the paperwork and meeting with my bishop. Honestly, I think in the back of my mind, I was still hoping that this would be a situation like Abraham's. I thought maybe the Lord was testing my willingness and then He would say, "never mind. You don't actually need to serve a mission, but thanks for trusting me." The process was long and there were a lot of hiccups, but finally I received a call on May 8th to the Pennsylvania Philadelphia Mission. When I opened my call, I was hoping for an overwhelming feeling to come over me that would lead to a strong desire to go. I was emotional and excited, but I was still scared out of my mind. Ultimately I had decided to go because I knew without a doubt that God wanted me to. I was hoping that the strong desire that I had seen in so many of my friends would come, but it didn't. I knew serving a mission would be one of the hardest experiences of my life. I knew that I had better come up with a good reason for why I was going, if I wasn't going because I wanted to. I remember reading my patriarchal blessing one night. It mentions my "many, many children." That night I decided that if I wasn't going to serve for me, I was going to serve for them and because God wanted me to. "When you have a good enough why, you can bear any how." My future children became the why. Whenever I was scared, I just thought about how much I want to be a wife and mother. Up until the day I went to the MTC, I still did not want to serve a mission. If it had been completely up to me, I wouldn't have. But it wasn't up to me. It was up to God and the plan He had for me. I wanted to follow that plan and so, even though I was scared out of my mind, I left my family at the curb of the MTC for what would be one of the hardest, greatest experiences of my life. The lessons that I learned while serving absolutely taught me how to be a better mother. They also taught me to be a better member of the Church, and ultimately, a better disciple of Christ. I know that serving a mission is not for everyone. I know that God has a customized curriculum for each of us, meant to shape us into what He wants us to be. I also know that God wanted me to serve. Whatever it is that God asks of us, knowing the why helps us get through the how. Scenario A: Someone asks me to do 1000 pushups for $10. There's not a snowball's chance in h*ll that I'm going to do 1000 pushups for $10. Scenario B: Someone asks me to do 1000 pushups for $10 million. I start figuring out how to do 1000 pushups. So what changed? The task remained the same, 1000 pushups, but the reward increased. My desire to fulfill the requirement came only when I saw the higher reward. If you have a good enough why, you can bear any how. My application for graduation got approved yesterday. The next 6 months are going to be pretty brutal. I have a lot of work to make up from missing so much school and I'm taking a lot of intense classes next semester. But knowing that I'll graduate makes whatever it takes worth it. All of the long days and late nights will fade away once I have that pretty little diploma in my hands. Right now I have a pretty good why, so I'm willing to do whatever how it takes to get there. Our relationship with God involves a similar principle. When we don't understand the reasons behind them, the commandments of God can seem like burdens and limitations. But when we learn what God promises in return for keeping those commandments, we do our best to do what He has asked of us. We are willing to keep God's commandments only when we learn how high the rewards are in relation to what God asks of us. What God has promised us is worth a whole lot more than 10 million dollars. He has promised us that our families can be together forever. That we can be exalted and live in His presence. Those are the most incredible whys which means they're going to require some hard, but oh-so-worth-it hows.